1. G6 has posted the recipe for Gruenkern Soup. Now I just need to find out what can be used as an alternative to gruenkern kernels that is more readily available. 4. Lost in Kollel has a post about an outrageous statement made by a school administrator during tuition negotiations with a kollel guy. The administrator basically told the guy he should leave kollel and find a job in order to be able to pay tuition. I agree with the point made by "Lost" that it is important to have diversity and solutions need to be found so kollel families can continue sending their kids to school - and the solutions need not be leave kollel, but he makes a very general statement that is just as outrageous - he says "Kollel families generally are of a higher caliber". Everybody has their own problems. Yes, non-kollel families have issues with too much exposure, sometimes, to the outside world, and sometimes that leads to problems. But kollel guys have other problems, perhaps too little exposure to the outside world which makes them react to the extreme when they are exposed, perhaps frequent financial difficulties (not limited to kollel families but perhaps more common among them) weighs heavily on the family and affect the childs ability to concentrate, etc. that lead to kids having problems as well. Just the problems are different. 5. Casspi the King announces Omri Casspi will be playing in the NBA Rookie All-Star game..
Turkey PM Erdoan: Israel is likely to lose a friend..
As they say, with friends like that, who needs enemies??? The courts have rejected the petition appealed by the Opposition of Bet Shemesh Municipality against construction in RBS C.
You can see the whole court decision in Hebrew here.. It never had much of a chance and I don't know why they bothered pursuing it rather than finding more realistic ways to fight the local demographics change - such as putting together groups of buyers to submit bids on projects. --- Somebody just explained to me that this is not a rejection of the appeal. Yet. This is a rejection of the Stay request. Let's say I lose a case in court. I file an appeal and, in the meantime, ask the court to stay the lower court's decision, so that no damage will be done. The court can give a temporary stay on the decision, which means that the lower court's decision will not be implemented, pending the appeal court's decision. Very often, the court will hint to the appellant, by denying the motion to stay, that the appeal has no merits. That's what happened here. The court basically said that if you pursue this case, you will lose. In the meantime, since your chance of winning is so low, we are allowing the tenders to procede. If the appellants withdraw the appeal at this stage, before the sides presented all of their arguments and having to attend hearings, the court might allow the withdrawal to happen without being ordered to pay court costs. The weather we have been having has been totally insane. This shabbos was unusually warm, but extremely overcast. the air was full of dust. It drizzled a bit, but it mostly felt like the sky was sweating and some drops of perspiration fell out of it. Even more so was the strong winds that prevailed for much of shabbos. They were so strong they even blew the [aluminum] roof off of a school building/caravan. I guess it was fitting for the parsha that discusses a strong wind blowing all night in preparation for the Kriyas Yam Suf.. I was walking home from a meeting yesterday, when a short elderly Russian lady approaches me. She is waving a paper at me, and I figure she either needs directions or is soliciting donations. I take a look at the paper and she starts to explain at the same time. Interestingly enough the paper was written in English, and I had expected Hebrew - she must know the neighborhood. All she was doing was collecting signatures on a petition to stop the Chinese from abusing, oppressing and killing the Falun Gong. While human rights are important anywhere in the world, I was a bit surprised. I had not expected this at all. As I signed the petition, I asked her if she thinks this will help. After all, what do the Chinese care about our signatures? She said of course they care, as how can they ignore a hundred million signatures? I said they can ignore a hundred million because they have over a billion of their own! I signed the petition and wished her luck. Of all the petitions I could have thought of that would be solicited around RBS, this is one I had not expected! Shabbos Shira is always one of the best examples of how minhagim change over the years. This shabbos there is the custom of feeding the birds with bread crumbs. The reason for this is two-fold, connected to the manna and connected to the shira. One reason is because when Hashem first gave the manna, and on Friday the Jews were told to collect double portions as the manna would not fall on shabbos itself. When some decided to make trouble and put manna back out on Friday night so when everyone would wake up shabbos morning and see the manna outside they would think Moshe was wrong and it did fall on shabbos, the birds came to save the day. The birds came and ate the manna and the plot was foiled. As thanks to them, this shabbos, on the portion of the giving of the manna, we put out bread for the birds. The second connection is the birds speak in song. Song is considered the realm of birds. Ever hear the phrase "She sings like a bird"? So on this shabbos, when we use the tool of the birds, we sing the praise of Hashem for splitting the sea and saving us, we thank the birds for allowing us their tool, and we put out bread for them. I remember growing up that we would put out the bread crumbs for the birds on shabbos. That was the minhag for SHabbos Shira. Only much later did I learn that many say that one should preferably put the bread out on Friday, as it is prohibited to feed wild birds on shabbos. One can only feed on shabbos pets that are in your own possession. I was told that you must put the bread out for the birds on Friday before Shabbos Shira. I recently found in the Aruch HaShulchan (324:3) that he says "There are those who speak otu against the minhag on Shabbos SHira of throwing wheat kernels to the birds, because of the problem that you are not responsible for feeding them. But, to me it seems that minhag yisrael torah - we are not troubling oruselves for them, but rather it is for ourselves, as we are returning the favor, so to speak, and the intention of it is to remember the joy of Shiras Ha'Yam, and there are those who write that because this is our intention, it is therefore allowed [to feed the birds on this Shabbos]. However, the custom still stands and some people say this is the exception. So some put the bread out on Friday, and some put the bread out on Shabbos. If you wish to put out bread as per the custom and are unsure of what to do (Friday or Shabbos), ask your local Rabbi for advice as to the best way of dealing with this custom. A cross section of Bet Shemesh's diverse populations met on Tuesday night to discuss ways to bring more unity to the city. The decision was made to move forward with a city wide Mishloach Manot project. We will arrange for chareidim and datiim to bring mishloach manot to masoratim and chilonim and vice versa. Close to 100 datiim and chareidim have already signed up and we hope that hundreds, if not thousands, will join together for this important project. Representatives in the Russian and Old Bet Shemesh communities are working to develop lists as well. Please e-mail me at ddlipman@gmail.com if you want to join. Please include your name, address, and cell number. Let's remember that the redemption in the time of Purim came because of "Leich k'nos et kol hayehudim" - the Jews unifying together as one. We can certainly use redemption and we for sure need to take strides towards more unity. What better day to start that process than Purim? Tu B'Shvat is one of those holidays that don't really have any celebration. If you are hassidic or sefardic you might have a "Tu B'Shvat Seder", which is basically sitting down to a plate of dried fruits and nuts. Not very celebratory as far as Jewish holidays go (compare it to the lavish meals we serve in honor of all our other holidays). As kids we used to eat buxer on Tu B'Shvat. I can't think of any way more repulsive and repugnant of celebrating a holiday than by eating buxer. It was absolutely disgusting. I always thought of it like eating tree bark, but worse. We would nibble a tiny bit from the tip to "be yotzei", if we could get away with it. What kind of holiday is this if we have to eat buxer??? I don't see people eating buxer nowadays, so either it is not common in Israel or people finally wised up to the fact that eating something disgusting is a silly way to celebrate an important day. I also heard you are supposed to daven on Tu B'Shvat to have a nice kosher Esrog on Sukkos. I don't know why you need to daven for an esrog more than for any other object of a mitzvah, but so be it. What else do people do on Tu B'Shvat? It seems to be more symbolic of the beginning of spring, kind of like Groundhog Day, l'havdil, rather than a real holiday. I was at an event last night in which Rabbi Paysach Krohn was the guest speaker. I have not heard Rabbi Krohn speak in many years, so his stories were new to me. He told a lot of great stories tonight. "I've got a great story to tell you" is how he introduces every story, and every story is really great. He is a spectacular storyteller, and has even gotten funny over the years. This guy (I don't remember the name) had a streak of 30 years that he did not miss a minyan. Wherever he was, he always made sure to find a minyan to daven with. It happened that he found himself one night in Yerushalayim at a wedding, and after he left at 3 AM (I assume it was a relatives wedding for him to be there so late) he realized he had not davened maariv yet. Where is the only chance in Yerushalayim to get a minyan at 3 AM? Zichron Moshe. So he heads out to Zichron Moshe and finds 1 guy there. He says to the guy "did you daven?" the guy says no. He then asks if he thinks they will be able to get a minyan. "Get a minyan? They will start coming for shacharis vasikin in an hour or so!" The guy says that in 30 years he has not missed a minyan and he does not want to break that streak. They brainstorm for a few minutes and he figured out a plan. He called a taxi company and asked them to send 8 taxis with only Jewish drivers. Taxi company said they don't have 8 taxis at 3 AM. They agree to send 5, while he calls another company and orders 3 more taxis with Jewish drivers. the taxis pull up and wonder what is going on that so many taxis are needed at 3 AM. He comes out to the taxis and tells them to start their meters, get out of the car and come help him make the minyan. he would pay them to stand there while he davens. At the end of the minyan he goes to pay the drivers. The first driver he approached was religious. The driver refused to accept the money. The driver says I have davened my whole life but have never seen such dedication and kavana as I saw tonight in this minyan. I will not take money for it. The next driver he approached was not religious. He asks how much the meter came to. The driver says he is not taking any money - he says he is not religious and has not even gone to shul in 7 years - not even on Yom Kippur! But you got me into a shul and I was impressed - I should be paying you!" In the end all the drivers refused to take money for it, because his dedication to his mitzva impressed them so much. According to the Geneva Convention specifications? That is why Red Cross has not been allowed to see him? That is why he has not been allowed letters or correspondence? In this weeks Yated Ne'eman chinamon edition, the main theme was stepping up the hostility between Shas and Degel HaTorah over Shas having joined the WZO. Gafni had spoken out very harshly against Shas for giving up the ideals of haredism simply to get jobs in WZO and other related organizations for people connected to them. Shas responded in kind taking it as a slight to Rav Ovadia Yosef, saying Gafni had no right to criticize - they have their gedolim they listen to who approved this and he has no right to speak against Rav Ovadia. In the Yated, this was the main theme. Continuing the attack on Shas. Even their fight against the internet had to take a smaller role this week. The internet ban only got a small article (about not advertising on haredi internet sites), while the Shas-Degel fight got a large article and 3 large editorial columns. Shas supporters responded to the Yated attacks by going around Jerusalem and other areas where the Yated is distributed for free on Tuesdays, and removed as many papers as they could and dumped them in trash cans. As well, some Shas affiliated rabbonim have stepped up the verbal spat further blasting Gafni, and the Yated, on air for what he said. It seems to me that this is classic Shas against classic Degel. Degel is into ghettoizing the haredi community, Fight for what is necessary so the community can continue to thrive on its own, but don't mix too much into society or public affairs. Just the minimum to achieve what we need. This is why they ban the internet. This is why they ban furthering secular education and make it harder for people to join the workforce. This is, or perhaps I should say has become, the raison d'etre of Degel HaTorah. Shas, on the other hand, is more involved in society. Their method is embracing the world and trying to improve it. They refused to join the internet ban because they realize the Internet is here to stay and instead of banning it, which will never work anyway, better to use it for good and teach people, affect people, over it in good ways. They get involved in all aspects of government.. Their people get educated and work, without having to feel second class. This fight over WZO is the same thing. Degel says, via Gafni, better to seclude ourselves. WZO is Zionist and impure - they have Reform and Conservative representation. Better for us to not get involved. Shas goes out and gets involved. This is a realm in which they feel they can begin having influence. And anyway, Shas was never really a purely Haredi party. they were always far more Zionistic than the ashkenazy haredi parties. Many of their supporters are traditional and not specifically haredi or even religious. This is true despite their having a haredi appearance and leadership. The haredi lack of acceptance of anything Zionist is in full gear. Yesterday it was made offical - the new IDF Chief Rabbi is Rabbi Rafi Peretz, as Rabbi Ronsky's term was not extended. I dont know much about Rabbi Peretz, other than the little I have read about him in the bios in the different papers. He is a rosh yeshiva, so I am sure he knows his stuff. What the haredim are focusing on to start with is Rabbi Peretz's appearance. This is good because it means they don't have anything substantial and instead resort to pettiness. The rejection of him as being worthy of taking the position was a given from the get-go. Simply because he is not haredi, but Dati Leumi. So instead of anything substantial, like criticizing any specific controversial psak or statement he might have said and using that to say he is not worthy (as was done regularly against Rav Ronsky), they are simply saying he doesn't look like a rav. He wears aviator sunglasses and has no beard (Rabbi Peretz served in the air force as a helicopter pilot). 3. G6 has posted about the Breuers bris menorah..
6. According to Jameel, Obama is considering raising the Child Tax Credit to $2000. Now let's see who doesn't like Prez Obama! 8. Remember when Prez Abbas of the PA announced his coming resignation and everybody shed crocodile tears as if his resignation would cause such a disaster? Well it seems that that was only the English announcement because according to EoZ, in a recent Arabic announcement he declared himself Prez for Life. Viva le Abbas! I am all for building in Jerusalem. Build thousands and thousands of apartments. If they can convince the government to do it, great. There are two points about this that bother me. the idea that Haredim should only live in Jerusalem or other parts in the center of the country. Regarding point #1 - Many are upset that the haredim are being sent to remote parts of the country. The demand to build thousands of apartment in Jerusalem is only to avoid sending the haredim to buy in cheaper areas that are further away. There is no reason Haredim should say they can only buy in Jerusalem, and not in more remote areas. Land in the Jerusalem area is very expensive, and if they want subsidized housing they should be willing to accept land in cheaper areas. Regarding point #2 - Whoever can afford to buy in Jerusalem, all the power to him. But to force the market by either driving prices down artificially or by offering subsidies so people who cannot afford suddenly can easily own expensive land is not right. This drives down the value of land held by people who invested their money in expensive land. Why should the government subsidize expensive land when they can subsidize cheap land? Nobody owes anybody anything in this regard, so the demand to cheapen the land so a specific sector can buy it is illogical, and unfair to others who paid full value. Let the government build thousands of apartments in Jerusalem and sell them at full value. Then whoever really wants to live in Jerusalem, and can afford it, will buy those apartments. Is Parshat Ha'Mon a segula or not? Today is the day people consider it a segulah, or perhaps a better word would be a "yom mesugal", to say Parshat Ha'Mon - the psukim of the portion in the Torah describing the falling of the Mon, and how Hashem sustained the Jews in the desert for 40 years with this miracle manna. The idea of the segulah is that this week is Parshat B'Shalach, in which the portion of the manna is found, and reading it is meant to remind us that it is Hashem who provides us with our sustenance, not our own toil and efforts, no matter how necessary and important they might be. With this reminder and reconsideration of the real source of sustenance, perhaps Hashem will be more inclined to give the extra assistance in providing the sustenance. And once on the topic, Kikar Shabbos has a write-up about how this segula is false. Basically it is recommended, and brought in Shulchan Aruch, that one should read the parshat ha'mon every day. There is no special power in reading it today, but should be read every day. According to their research, the source for the segula is given as Reb menachem Mendel of Rimanov. yet when looking at the calendar of the year that prints all the minhagim, one will see that he says he spoke with the descendants and they deny his being the source and that they have no special minhag of saying it today. The only source found for it, according to the article, is printed in a sefer that quotes someone who quotes Rav Shalom of Stropkov, who supposedly said in the name of Reb Menachem Mendel of Rimanov that it is a segula to say it on this day. Their conclusion is that such a weak source cannot be relied upon to actually consider it a real segula. Real segula or not, say it every day or not, any time you say, today or any day, it you should think about the source of your sustenance and reconsider that while you have to put in your effort, it is ultimately Hashem that provides parnassa, and hopefully reconsidering this will be a merit for Hashem's beneficial sustenance. The RBS Torah Achdus group has put together a very special program for this Shabbos - Shabbos Shira-Tu B'Shvat. Please join us for a very special Friday Night Oneg Tish this week, Parshas Beshalach, in honor of Tu B'Shvat and Shabbos Shirah. Come and share in a unique opportunity of community achdus through Divrei Torah, singing & food. We are expecting each Rav (who is in town for this shabbos) to appear and share a short Torah insight. This event is for men. Please do not bring young children. Thank you. “RBS Torah” was launched a year ago to help build the achdus in the anglo community of RBS. 1. They have had 5 joint-shiurim throughout the year featuring different rabbonim speaking together, at “the same pulpit” – this exposes different kehillos to different rabbonim they would otherwise not hear, and even the rabbonim appreciate meeting other rabbonim! 3. This event is intended to do more of the same – build the feeling of unity between the shuls, expose people to the different rabbonim, and just have an uplifting evening of ruach, eating and achdus! Approved: All convictions of those who opposed the Disengagement will be canceled. The trend today should not be direct conflict with the Palestinians, rather capturing the hearts of the other nations through the Torah.... this has a special power to attract the nations of the world to the service of God. 2. Making Aliyah about the beauty of the country..
5. Parshablog on fault lines and find spiritual blame when natural disasters occur..
7. Zoo Torah has a picture of the greatest bus ever..
A segula that did not work, is now being called a miracle. Rav Yisrael Yaakv Fisher, aka Dayan Fisher, ztl, was big into providing segulas for pregnant women who were having problems. And of all the different segulas an rabbis who gave out segulas, people swore by Dayan Fishers segulas and considered him a master at these things, despite his not being sfardi. Kikar reports that one of Dayan Fishers segulas was tested recently, and it didn't work. But they then found out that it was a miracle it didnt work. The situation was that a woman was told her baby was breach. Being that she was already in her 9th month of pregnancy, it had to be turned quickly. Instead of hoping for it to turn on its own and instead of having the doctor force the baby to turn, they decide they would first try Dayan Fisher's segula. 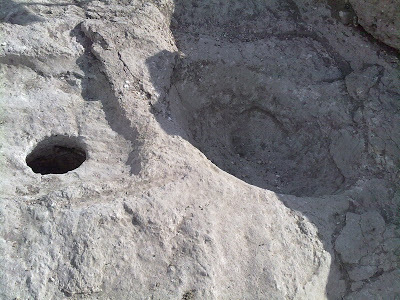 The segula for getting a baby to turn is to go to the Sataf (a spring near Ein Kerem) and to drink water from the spring, passing the water first from the husband to the wife (note: before you rely on this, get the exact details of what needs to be done). Rav Fisher swore by this segula saying it always worked and he promised it would always work. The only time it would not work is if the umbilical cord was wrapped around the babies neck. Sure enough, his couple with the breach baby went to Sataf and performed the segula. When they went back to the doctor, they found out the baby was still breach, meaning the segula had not worked. As they were preparing for the doctors appointment for the baby to be physically turned, they went through some monitoring and ultrasound tests. After the results came back that all is ok and they can go for the procedure, the husband asked the technician to please check again to make sure the cord is not wrapped around the neck. She agreed and checked it again. After calling in a doctor, they realized the cord was wrapped around the neck. Had the baby turned, the baby would have died. The segula did not work because the cord was around the neck and the miracle saved the baby. They performed a c-section and the baby was BH healthy. Miraculously in this case the segula did not work! Mazel tov! Even the cemetaries in Israel are now online..
Har haZeisim, the Mount of Olives, must be one of the most difficult cemetaries to have to go visit. It is hard to find graves, even if you thought you knew where the person was buried. Now it might be easier. This new website will let you look for the grave online so you can figure out in advance where the grave you need to go to is located. [Regarding the planting ceremonies of saplings in Gush Etzion, Maale Adumim and Ariel]...there we have planted a university... The plantings represent unity that these places will forever remain as part of the state of Israel. I call upon everyone to plant in the blocs around the country. Last week, Minister of Education weighed in on the fight in Bet Shemesh about the Public School Beit Sefer L'Safot in RBS. Gidon Saar stood up in Knesset and announced that the school will not be closed. Despite low registration, the school is an excellent school teaching ata high level and it ill not be closed. If registration continues to drop, he will recategorize the school as a school designated for a region rather than for a specific neighborhood. In response Mayor Moshe Abutbol sent Saar a scathing letter calling him out for making a "political decision". Abutbol said that he will continue to work to close the school until he hears a professional decision stating otherwise. Funny thing is that Saar, as Minister of Education, has the right to overrule and overturn decisions like this. So if he decides, for whatever reason, that he wants the school to stay open and in its location, he has that ability. Mayor Abutbol's arguments in the letter were actually very clear and very strong (even if he presented the arguments in a slightly disrespectful manner), and he made good points. Abutbol said that professional teams from the Education Ministry have been working on this a long time and have come to professional decisions - you can't come and wave your hands and overturn all that work and all that reality without having a good, clear reason supported by re-analysis (it was more detailed than this, but this is the gist of it). Abutbol added that in light of the flippant method in which Saar overturned the previous decision, he will not take it seriously and will continue to work towards dismantling the school, as the professional team had concluded must be done. If Saar would contact him directly and explain otherwise and have it re-analyzed by a professional team rather than just using a political announcement, he will stop. What I find ironic is that throughout the fight, as the parents and supporters of the school were tryign to fight the decision, and were meeting with Abutbol to present their side, Abutbol said many times that it was not his decision but was the decision of the MoE. Now that the MoE has changed their mind (for whatever reason), Abutbol is saying he will ignore that and fight to continue closing it. He previously pushed them off passing the blame on the MoE, but now his true face has come out. Based on what he said earlier, he should have been overjoyed that he could now tell the parents that the school will be staying as the MoE reversed their decision. In Bnei Brak last night there was a hafganah, seemingly supported by Rav Shteinman and Rav Kanievsky. The hafganah was outside the house of a guy who caused a tremendous chilul hashem last week. A haredi guy who didnt like a psak din in beis din, and he took the beis din to court to appeal the din. 8 dayanim were forced to go to secular court to defend their psak din. Last night they gathered outside his house crying out "Get Out! Get Out!" 1. Joe Settler profiles MK Dr. Michael Ben-Ari..
2. Rabbi Fink is proud of the Jewish and Israeli response to the tragedy in Haiti..
3. Voice from the Wilderness suggests an alternative way of looking at the Jewish response to the tragedy in Haiti..
5. 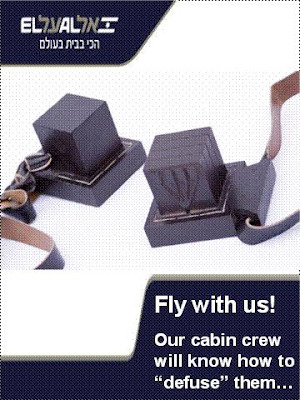 Modern Uberdox on "niskatnu ha'doros"
Is there really a flight attendant anywhere in America that has not seen Jews put tefillin on during a flight and doesn't know what they are? Really? I thought America is such an enlightened country! CBS News said a passenger had strapped a wire device from his fingers to his head after takeoff. He was taken into custody after landing, it added. I guess the stewardesses ignorance can't be helped, or blamed on anybody, as the guy did nothing wrong. But at least he is described as being "non-disruptive, totally polite and of course didn't make any threats to anyone.."
Addition: I was just thinking that this guy wearing tefillin caused the plane to divert and make an emergency landing. Perhaps, and nobody has any way of knowing (so you can't contradict me), this is an example of the Gemara in Nidda 31a that describes how frequently Hashem performs miracles for people, saving them from calamity, in ways that they are not even aware of. The gemara there describes a guy who missed his ferry. Later the boat sank. Perhaps the plane was diverted in order to avoid some calamity, in the merit of this guy who performed his mitzva diligently. Sometimes you just gotta love Shas. They have become experts at taking advantage of their political power for benefiting themselves, and in the process others. Yesterday Shas submitted a law for voting, that passed the initial vote (and now has to pass the final votes), that would exempt batei medrash and the social halls of shuls from paying arnona. Currently only shuls are exempt from paying arnona, but if they have social halls they are obligated to pay. The proposed law came under fire from the opposition claiming that shuls are already exempt, so changing that to also exempt social halls and other offices fictitiously used as shuls is a cynical abuse of power to squeeze more money out of the people in the form of tax exemptions for what are ostensibly businesses and nothing to do with religion. After the recent attempted terror attack by a Nigerian on an airplane over Detroit, America flipped out about airline security. The methods employed by US airlines was compared to the methods employed by the Israelis. Who didn't see the videos of the Israelis explaining how the Israeli system works looking for suspicious activity rather than screening random people or targeting specific items (like drinks). And who had not read the articles that spread virally discussing, ad nauseum, the same issues. It turns out that that was all a bluff. That is not why the Israeli airlines are so safe. It's got nothing to do with the specific security measures employed by the Israeli airlines. The new director of El Al went to meet with Rav Chaim Kanievsky. Rav Kanievsky gave him a bracha, and they sat and discussed various aspects of kashrut and hilchos shabbos relevant to the airlines and flights. This is a party that just for the jobs is willing to go sit with the Reform. What will come of it for the Jewish people? Education? Aliyah? I couldn't believe this could happen. It seems that jobs are more important than the most important aspect of religious Judaism, the holy Torah. Today I am embarrassed to be a Haredi MK. I am for dialog, between all sectors of the population. But this is a group that I will not sit with under any circumstances, and that is the Reform and Conservative. They tear the Torah to shreds. Shas responded that they follow their rav, Rav Ovadia Yosef, who weighed the considerations and decided to allow them to join the WOrld Zionist Organization, and attacked Gafni in return for speaking against gedolei yisrael (Rav Ovadia in this case), and has subsequently announced they are cutting ties with Gafni. Oy. If you thought the drug smuggling ring to Japan was a one-time affair with unknowing yeshiva bachurim just trying to help out a fellow haredi who duped them, think again. The police just arrested 18 yeshiva bachurim in Jerusalem for running a drug smuggling ring. The article gives no details of what type of yeshiva bachurim they are, and there is a very wide range of types of yeshivas. Perhaps they are hassidic? Litvishe? Maybe they are part of one of the yeshivas that deal with boys who have drug problems? So, while this can't paint a bad picture for all yeshiva guys, it is still unsettling. The United Nations has asked for help to stop the looting in Haiti. One of the countries asked for assistance was Israel. Israel has responded by sending 100 policemen to Haiti. Tzipi Livni is fighting for her political career. She has so far failed to bring any success to kadima, despite having two opportunities to try to form a government. For some reason unkown to anybody (except maybe to some inside Kadima), there is almost nobody in Kadima willing to stand up to her. They let her rule with an iron fist and vote sheepishly to let her continue in her losing ways. The only one to stand up to her is Shaul Mofaz. Yet, despite his attempts to push her out, he has been unable to rally the troops. I don't know if that says more about her level of control or more of his lack of charisma and ability to lead. Regardless, Kadima is having a session today, and will discuss the possibility of holding a primaries election to decide the leader of the party. Livni supposedly had toyed with the idea of supporting early primaries, though not immediate, as a way of relieving the tension in the party. She has since decided to oppose early primaries, as she had until now. Livni said "The motivation behind those who insist on early primaries is only to push me out". Wow. Livni is one smart cookie. What else did she think the reason might be? This is a year that was wasted for Israel by this government. You have given politics a bad name. According to Rabbi Metzger, Chief Rabbi of Israel, the Rabbanut hechsher of chalak (a.k.a, for all intents and purposes, "glatt") meat does not fall short of the Badatz hecsher. Baba Baruch, Rav Baruch Abuchatzeira, the son of the Baba Sali, has given an interview to Bechadrei Chareidim to commemorate the Baba Sali's yahrtzeit. The interview is pretty interesting as he describes some of the greatness of his father, and relates various stories his father was involved in. One part in particular stands out. Baba Baruch describes how his father has appeared to him at different times in dreams. One such time was during Operation Cast Lead they did not know if they should plan a hilula in honor of the Baba Sali's yahrtzeit. The Baba Sali is buried in Netivot and that was within range of the Grad missiles being shot into Israel at the time. To bring thousands of people to Netivot for a hilula seemed irresponsible. Baba Baruch says that the Baba Sali came to him in a dream and told him to prepare the hilula and he would take care of the rest. The next day he got word that they had agreed to cease fire. Baba Baruch then says that the Baba Sali appeared to him in a dream less than 2 weeks ago. In this dream the Baba Sali told him that Mashiach will come this year, and that we should prepare and be prepared for his arrival. Halevai it should come true! In yesterdays Yated ne'eman weekly chinamon edition, there was a clear move away from the extremely militant stance they have taken in recent weeks in the haredi fight against the Internet - that the Yated basically spearheaded and ran almost singlehandedly. Instead of the announcements similar to those of previous weeks in which an issur was stated with threats and no exceptions allowed, this time it spoke about it being assur and like any other question of issur one should consult his rav to find out if and when and how he can use the Internet. In addition, and perhaps this is the greatest hint as to what is really going on, they posted that the current filter solutions are unacceptable, and they have appointed a team to work on a new filter solution that will allow people who need internet access to have it in a proper and kosher way. So at the end of the day, all they wanted was just to get into the business. By banning the internet and then releasing it only through them, they have guaranteed themselves a client base for whatever new program these askanim are going to create or support. A new law has been proposed that would allow women whose husbands are away on miluim to take off from work for up to 3 hours a day. the law would make her 3 hour daily vacation unpaid for the first 8 days of her husbands miluim. The benefit to her is that despite the no pay she can still take the time off to take care of her kids or other needs and her job is protected. After the first 8 days, from Day 9 until 28, her 3 hour daily vacation will be paid. The Marker says that the law has no opposition, and Bituach Leumi who will have to be the one shelling out the money is ok with it, so it is expected to pass. It is tough on women whose husbands are away on miluim. It is even more difficult when they work, as they have even less time to take care of the household needs with the husband away and the second set of hands missing. It is a good law that benefits people who give of themselves for the State. At first I thought maybe it seems unfair to move her burden on to her employer, as now he has employees who will be missing, which means work will be left undone. but in a country like ours, where we are all in the same boat and miluim is something that affects everybody, it is normal that the burden be shared, and it is Bituach leumi paying, not the employer. I think the employer sharing the burden in this way is less of a problem than the benefit gained of Mrs. Miluim getting some time off to take care of her needs. Plus, with the husband knowing that his wife is helped out in this way, perhaps it will be easier for men to agree to go on miluim, as they will know their wives are a bit more taken care of than they used to be. In a move that is pretty similar to what was described and discussed as a viable option in the comments earlier today, the Council for National Construction today voted and approved the establishment of a new city in the Negev, near Arad. The city, Kasif, will be designed for Haredim, and the construction will be appropriate for this community. 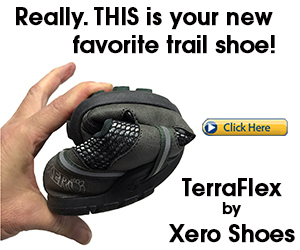 They approved 10,000 units for a minimum of 50,000 people. They also approved a higher percentage of public buildings, as is needed in haredi communities, for more shuls and schools than the average city has. The Nature Protection Society had voted against and says it is a bad idea as it will destroy the local environment, it uses up valuable free and open space, and many towns in other parts of the Negev are far from completely maximized, and they should be filled up before building new cities. 10,000 housing units is a large amount and can make a serious dent in the housing crisis. After many setbacks, things appear to be heading in the right direction. There have been meetings this week with people with influence over the process of the library. One is Aage Myhre who is director of Vilnius International House. He is Norwegian and has lived in Lithuania since 1990. He is not Jewish but very interested in seeing the library become reality. There are now some real players involved. Three of them are members of Parliament. Another is the director of all libraries in Lithuania. Another is Professor Dovid Katz who teaches at the Vilnius Yiddish Institute. Another is Rachel Kostanian. She is deputy director of the Vilna Gaon Jewish Museum. She is also a Shoah survivor. Yesterday, I was able to see for the first time the space which will hopefully house the library. This is not the permanent location but it will be more than suitable for two or three years. The place is directly across the street from the Parliament and the National Library buildings. Both can be seen from the front windows of the proposed library. There is room for concerts, lectures, and offices. I say not permanent because eventually the collection will outgrow those rooms. However, it is a beautiful and fitting location in which to begin. After years of work, I feel like I can finally see the light at the end of the tunnel. There is one thing which still needs to be done. The Prime Minister is the one which will have the final decision in this matter. I was told the best way to influence things in a positive manner is to receive letters of support for the Vilnius Jewish Library. The letters need to be actually mailed as opposed to being sent by email. I am reaching out to you and to anyone you know in getting out those letters. The letters can be printed out or hand written but all must be signed and there must be somewhere their name printed so it can actually be read. If a person is uncomfortable in providing a home address, they are very welcome to use a P.O. Box or business address. This is not a call for donations of money or materials. They do not need to send money. All that is needed now are those letters. Something simple along the lines of one or two paragraphs will be sufficient. People can write whatever they like. I just ask that it be along positive lines and not accusing the Lithuanian government of not doing enough for the Jews. Please write all letters to Prime Minister Andrius Kubilius. Time is of the essence here. Below is the address to which to send all letters. Feel free to forward this email and/or my contact details to anyone you choose. While letters from Rabbis are very welcome, each and every letter from whomever will look good as we make the case for a new center of Jewish culture and learning in the Jerusalem of Lithuania. P.S. Letters from Gentiles who are interested are also welcome. Below is the mission statement. There are also some links in regard to the library. The purpose of the Vilnius Jewish Library is to help strengthen Jewish culture in the Jerusalem of Lithuania. There were more than 100 synagogues and prayerhouses in Vilnius before the war. There was also the YIVO Institute which did so much to promote knowledge and education. Now there is one functioning synagogue here and, YIVO has moved its operations to the USA. Since the liquidation of the Vilna Ghetto, there has not been a proper center of Jewish culture. 2. Keep in mind that English is not the first language of Lithuanians. To help with reading comprehension, the library will be stocked with around 20,000 dictionaries and encyclopedias. Any reader who has trouble understanding a word or concept found in a book will have access to dictionaries covering everything from archaeology to zoology. In addition, there will be CDs and DVDs designed specifically to help students learn English. With a large collection of everything from children's books to the most scholarly, there will be something for every reading level. 3. Many believe that the time of libraries is past. After all, there are satellite dishes for television and high speed internet for computers. To draw people into the library, there will also be a big collection of CDs and DVDs. The music CDs will cover everything from the Beastie Boys to KISS to Streisand to Gershwin, Mahler, and the Klezmatics. This will be another way to highlight the significant contributions which Jews have made to popular culture. As for the DVDs, every Jewish library should have a copy of Schindler's List directed by Stephen Spielberg. However, since Spielberg is Jewish, I also will have Jurassic Park and Jaws. Harrison Ford is Jewish so there will be Star Wars included as well as any Ben Stiller film. Yes, there will be serious documentaries as well as thoughtful films made about the Shoah. The incredible variety of books, CDs, and DVDs is to show to the world the incredible breadth and depth of Jewish life and culture. I believe this is something which has never been attempted beneath one roof. 4. If all that is not seen as enough to bring them in, there is far more than that to attract visitors. Each night I plan to offer different events. There will be poetry readings, concerts, lectures, art exhibtions, as well as film nights. These events can be done by any person for any reason. The creator need not be Jewish and what they are doing need not have any Jewish connection. The idea behind this is that it will get people in the door who might not have otherwise considered visiting a Jewish library. Once through the door, they will be able to see for themselves the incredible array of material available to them. If everything mentioned so far seems still inadequate to bring them in, there will also be a cafe offering coffee, tea, and snacks. Kikar Shabbos has two articles about haredim working. One discusses the possibility of haredim being given jobs in Jerusalem as inspectors in haredi neighborhoods. The idea is that they can be sensitive to the residents needs and lifestyles while doing their work supervising the cleanliness and city workers and other aspects of the neighborhood. The City Councilman behind the idea uses Egged as his example of how this can work - Egged over the past few years has hired and trained a number of haredim to become bus drivers, and the community has responded well to it. The second article talks about how Superbus has offered the haredi community to take training courses to be bus drivers, good salary and benefits, a work situation that allows them to not compromise their lifestyle, etc. Yet they have not been taking advantage of the offer. They say some areas, like Elad, have a good response to these offers, but in other areas like Modiin Ilit the community has not stepped up. They think the reason is because of a bad stigma of being a "wagon driver". Whatever the reason is, and maybe it is simply the terms not being goood enough (despite Superbus saying they are) or other reasons, it is funny that in one article Egged and haredi bus drivers are used as a good example of how haredim would be happy to work within the haredi communities, and in the second article the haredim are refusing the same types of jobs. Tzipi Livni has made a bombastic statement today about her recent diplomatic snafu with the UK in which an arrest warrant was issued against her for her role in Operation Cast Lead. Livni said that she would be happy to go to England and get arrested. She would use her trial to defend Israel and explain Israel's position and why the Gaza War was justified, and that she would be happy to be the test case on this issue. I will note that Livni is a big talker but I don't see her running to England to put her money where her mouth is. At the time, it was a big embarrassment - to the UK, Israel and Livni personally - and now that she is not traveling to the UK it seems she is very willing to volunteer to be arrested. There is a housing crisis in Israel. It is felt by all sectors, but most acutely by the haredi sector. there is no doubt about that. With the high numbers of average children per haredi family, the amount of young couple getting married among the haredim far surpasses the numbers in other sectors. The housing crisis has been debated and politicized to the nth degree. Now UTJ is even threatening a coalition crisis if Netanyahu does not transfer half a billion shekels to the sector to alleviate the crisis and make it easier for the young couples to buy homes. Ariel Attias is working hard to release lands, and he is trying to find ways to flood the market with lands, and direct the tenders, that will cause housing prices to drop, so that it will be easier for the young couples to buy. It looks to me like an interim solution has inadvertently been found. The construction freeze. While according to all logic, the current freeze should be driving prices up, as demand is constantly increasing but supply is standing still for the most part, it might actually have the opposite effect. At least in some areas. Because of the construction freeze, the Vishnitzer Rebbe has told his kehilla that they should no lnger buy apartments in Modiin Ilit, and anyone already living there should sell and move. His reasoning is that they cannot live with a freeze. They need to be able to buy houses, move in and get on with life. With a freeze in effect, life becomes unduly hard for too many people, so they are moving the kehilla to Ashdod. With this declaration, we can expect a massive selloff of apartments, as his hassidim scramble to sell their apartments and move. I don't know how many apartments there are, but Kikar.net says there are 40 families already living there, and tens more that have been purchased by Vishnitzers that have not yet been built. So while it might not be enough to effect a price drop in the general market, it might cause prices to temporarily drop in that area. There has been a debate on twitter about Israelis helping or not helping others. the issue is specifically helping Palestinians from Gaza getting medical treatment. Some people think that while some are helped, the Israelis are mean, insensitive and cruel because they reject others and don't help them. Personally I find it to be a kiddush hashem when Israel allows Palestinians in for medical treatment. That being said, I see no reason why we have to let them all in. The army has decided that some people are safe and we can help them, while others are still a danger and we should not help them. I see no reson why we have to help everyone indiscriminately, and am fine with the army and/or politicians being selective. Many of them are hostile to us, and if the army decides certain people are unsafe or it is not prudent for whatever reason that is fine by me. Some people though are using the rejected Palestinians and making it look like Israel is: a) mean and not helping other sick people and b) bad at PR because if we helped them they would become our friends. It is easy to second guess, but we don't know why these people were rejected from entering Israel. If the army deemed them unsafe or hostile, so be it. There are other countries who can help them out. Nobody is looking at Egypt. Why do we have to solve everyone else's problems alone? We help plenty, but for certain reasons we cannot help everyone. The following clip, while nothing to do with the Palestinians, shows Israel does help, and goes well beyond the levels that other countries help and stick their necks out for other people. I would even suggest that the fact that we are willing to go so far out of our way to help, more than others do, shows that when we don't help it is for a good reason. 1. The Way spits on the Pope. 3. Kollel Guy suggests the possibility of being able to do twice as much in half the time. 4. Blog in DM comments on the new music hechsher.. 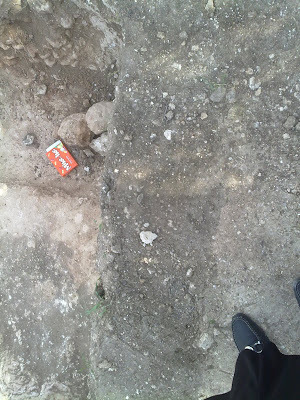 Yesterday I went up to the local archaeological site in RBS to check it out. I heard you can volunteer to join and help out the dig, so I wanted to check that out, and I also heard they were nearly finished - so I wanted to check it out before it all disappears. We went up and nobody seemed to care. The head archaeologist only cared as we approached her to ask about joining to dig for a couple of hours, as she wanted us to go around as where we were standing she said was dangerous. Other than that she let us walk around as much as we wanted and look, and paid us no attention. And she answered our questions when we asked, but she didn't give us a tour. The head archaeologist, Ilana I think her name is, on site told us they are finishing up the work. She said they have about a weeks worth of work left, and there is not really much to do so if you volunteer, they will give you busy work. NOTE: to volunteer you have to go to the Archaeologists website and fill out a volunteer form 9for insurance purposes) and fax it in. 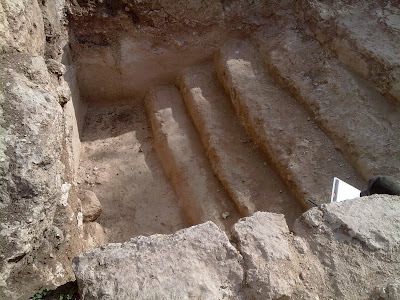 They have found in the site of the dig a well preserved mikvah, along with lots of pottery and ancient equipment, along with parts of houses and walls, parts of baths, etc. I asked if they found bones or graves and she said they did not, as this was clearly a settlement and not a graveyard. 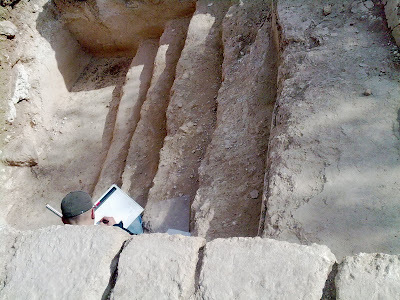 if you are a kohein I have no idea if the non-religious archaeologist has any ne'emanus for relying on her that there are no graves, especially considering how wary they would be to actually admit to finding graves considering they know it would create protests by the Asra Kadisha and others. Ask a shailoh. What is a shame is that I asked what will happen to all these finding when they finish the work. She told me that they will just bulldoze it. What a shame! She said they will probably try to preserve the mikvah because it is in such great condition. But aside from that, they will just bulldoze everything. I guess they took their measurements and studies and pictures and have no need for the actual finds. 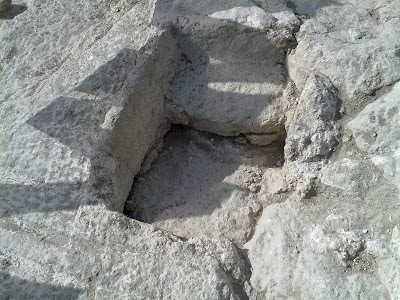 They said this is a zitsbath, common in finds from Hasmonean times - they would sit on the "bench" and have water poured over them. Here is the mikvah. How does it compare to today's mikvahs? I don't know if it was a mens or womens mikvah and didnt think to ask. And here is an ancient package of Mike and Ike's right near the entrance to the mikvah. If you look carefully you might be able to see the hechsher of the Hasmoneac Kashrut organization. Amazing what you can find right in your own backyard! What they don't get is that no matter how opposed a haredi person is to such things like mehadrin buses, and I think most "normal", moderate, haredim are (not including the Mea Shearim type and some hassidic groups) against the mehadrin buses (no scientific research to back this assumption, just based on my perception of articles read and forums participated in), they will generally not participate in such a campaign. There might be a few exceptions, and a few women who will call the hotline and "report" incidents, but the overwhelming majority will not. Haredim will not take part in a secular, or Reform movement, attack against haredim, even if they too are opposed to the subject of the attack and technically on the same side as the secular. haredim keep the fight in the community and consider it abhorrent to join forces like that. They will swallow their pride and prefer to remain submissive and discriminated against, rather than participate in a fight on the side of the secular against haredim. So I hope they are not expecting much of a response, and not basing their position on the idea that so many women will call their hotline as proof of discrimination. Hamodia has been running a series of articles on what Jewish poverty looks like in this generation with the economic downturn, people losing jobs or having salaries cut, etc. In this past weeks Hamodia there were two letters to the editor about a certain facet of one of the most recent article. They were both comments on a picture posted of an elderly man rooting through the garbage searching for food. One letter said "the pictures brought home the message in a way that really touched my heart...picture worth a thousand words..."
The next letter said "...but I was very disturbed by the pictures you used to illustrate your article...if poor people know that someone out there is taking pictures of them trying to find food in dumpsters, they will no longer do so fearing that one day they will appear in.."
Here is a clip of the IDF field team in Haiti having delivered a baby, and the woman called the baby "Israel" in their honor. Mazel tov! 3. A Mother in Israel discusses the shidduch crisis in the Religious Zionist world, the 5th part in her dating and marriage series..
4. Esser Agaroth notes that no apology has been issued to the young man, a grandson of Rabbi Meir Kahane hy"d, falsely arrested, and quickly released, for setting a mosque on fire. 5. IsraellyCool has a piece on the IDF in Haiti..
6. Israelity has the story of a guy from Australia who ran the Tiberias Marathon, and he is on a quest to run 52 marathons in 52 weeks. Good luck crazy man! The one ruling in Israel is an idiot and is crazy. And he has a foreign minister who has spoken about attacking Iran with an atom bomb. Bechadrei reports that a new rabbinic committee has been formed. This one is to control what is considered Jewish Music. They will put their shtempel on disks being published to certify that they consider it Jewish Music. Ostensibly, anything without their shtemple means that composer and/or singer did not follow their guidelines and the disk should not be bought. Bechadrei has posted the document listing various guidelines of how to play music according to what they consider Jewish music. In what could be a very monumental psak, Rav Chaim Kanievsky has issued a psak regarding organ donation. Many questions have been asked, and asnwers offered, over the years about organ donation, but what might make this the monumental psak is that it comes from a different perspective. Instead of the question being asked, and the answer given, from the perspective of the potential donor, this one is from the perspective of the potential recipient of the organ donation. Mishpacha newspaper reported this week that Rav Kanievsky was approached by medical professionals with the question how it is possible that it is prohibited to donate organs, yet it is allowed to receive organ donations. If it is prohibited to donate, it should be prohibited to receive, as it would be benefiting from a transgressed prohibition, and possibly assisting in the murder of someone [i.e. because you need the organ, the organ is being removed from the donor before halachic death]? Rav Chaim Kanievsky's response was that it is definitely prohibited to use organs that were taken b'issur. If the sick person only died in the category of brain dead, not only can't they take his organs, even if it will save another Jew, but the sick person waiting to receive the organ would not be allowed to benefit from the organ removed b'issur. This is monumental, because if it is verified, it might have to put an end to all organ donation in the frum world, or perhaps it will force a re-analysis of the whole process and force them to find a way to do it in a permissible fashion. I wonder if this is only a problem when the donor is a Jew, and if it is any different if the organ is coming from a gentile. 10 months ago, I submitted a proposal for a new law in Israel. New Member of Knesset Danny Danon (Likud) had created a great feature on his website in which he called upon people to submit suggestions for laws, and he would evaluate their worthiness and consider actually proposing them in Knesset. At the time I submitted a proposal for a law that would require the train authorities to inform the passengers of their rights to compensation when the train arrives late. After submitting the proposal, I had not heard any response and was disappointed. At the time I figured they were probably swamped with proposals, considering it was something never previously done. Eventually, I forgot about it. Danon's response to me said, "Hi, Rafi. Thank you for your submission. Unfortunately, due to the large number of submissions that we received via the website, we could not respond to your submission properly. We are currently in a process of improving the system of response to the public. We are confident that if you turn to us again in the future, your request will be responded to in the manner befitting it...."
1. Tzedek-Tzedek on Israel being Turkey's wet rag..
4. Geulah Perspectives has part 2 of the Chofetz Chaim's opinion on living in Israel..
6. The Wolf on the Internet ban..
What more do they want from us?